Well, I considered naming this post "The tour de port-o-potties" but thought I'd just stick to "race report". This was technically not my first half marathon pregnant, however the first was Tink when I was about 6 weeks along and had not even hit morning sickness yet. 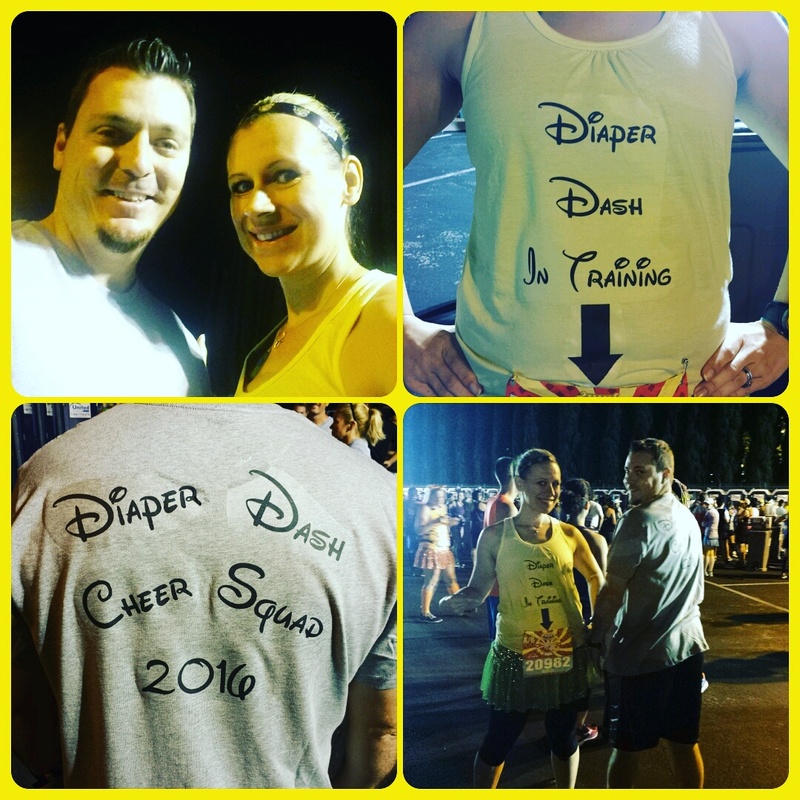 This time around I was sporting my bump, about 10 extra pounds, and a lot slower pace. 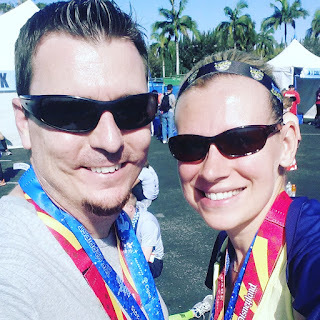 Bill and I decided to run together--he never has enough time to train for this race since it's right at the end of his busiest season at work and he wanted to be sure to support me and Baby S. Luckily he didn't mind going slow! We made some shirts (they came out great) and stuck to a pretty low-key look. We headed to the start with enough time to leisurely get into corral C. We made sure to line up toward the right since we knew we'd be walking and definitely hung back a little to let the faster runners get a good pace going. 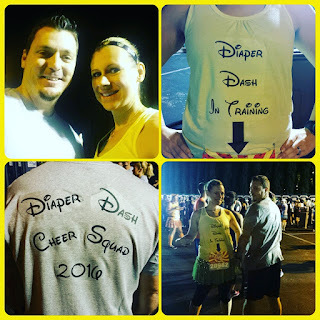 We started out at a 2:1 run/walk ratio, but a few miles in, the heat started getting to me (it wasn't bad, but it wasn't cool and being preggo doesn't help). We had to switch to a 1:1 run/walk and it felt much better. Yes, I'm taking notes for the next race. 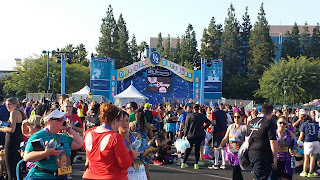 The course was a little different running through Disneyland. It felt like we had less park time and in less fun places than in previous years. I usually don't stop often for the bathrooms, but clearly this time around was different--I also noticed the lack of passing by park bathrooms! I was looking forward to taking advantage of the real bathrooms, but it was mostly port-o-potties on this course! Once we left the parks, it started to get light out. I'm usually through at least half of the course or more before the sun comes up. This was strange, and I was getting nervous about the heat. We made sure to stop at every water station and hydrate (of course, this added to the tour de port-o-potties). It was kind of fun to just take in the sights and sounds. This being our 6th year running we knew what to expect: classic cars, mariachi bands and dancers, tons of cheerleaders, and of course the huge crowd at the stadium. A few random course notes: You'll hear people complain about the dirt path right before the stadium. It stinks! This time around we actually saw a person fall right off the side ledge. Listen up runners--be careful--it's a short distance so just slow it down! The back of the pack is fun, but PACKED. 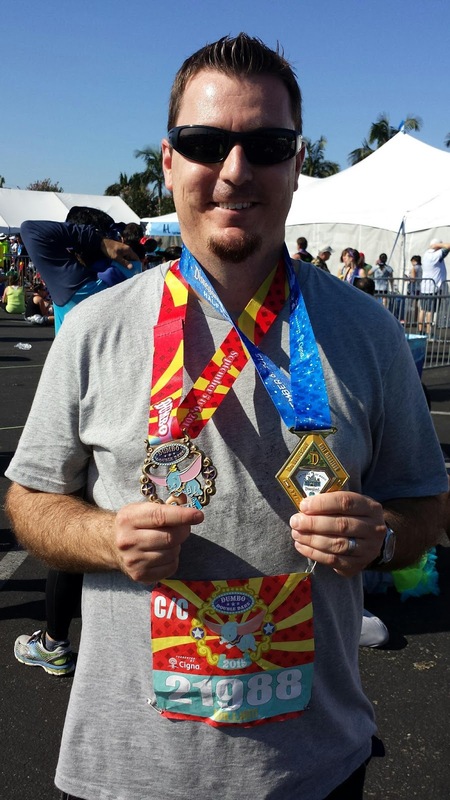 I'm not super fast, but at Disney races I'm usually in corral A or B, and keep that pace. This was definitely a different experience, but it was fun. 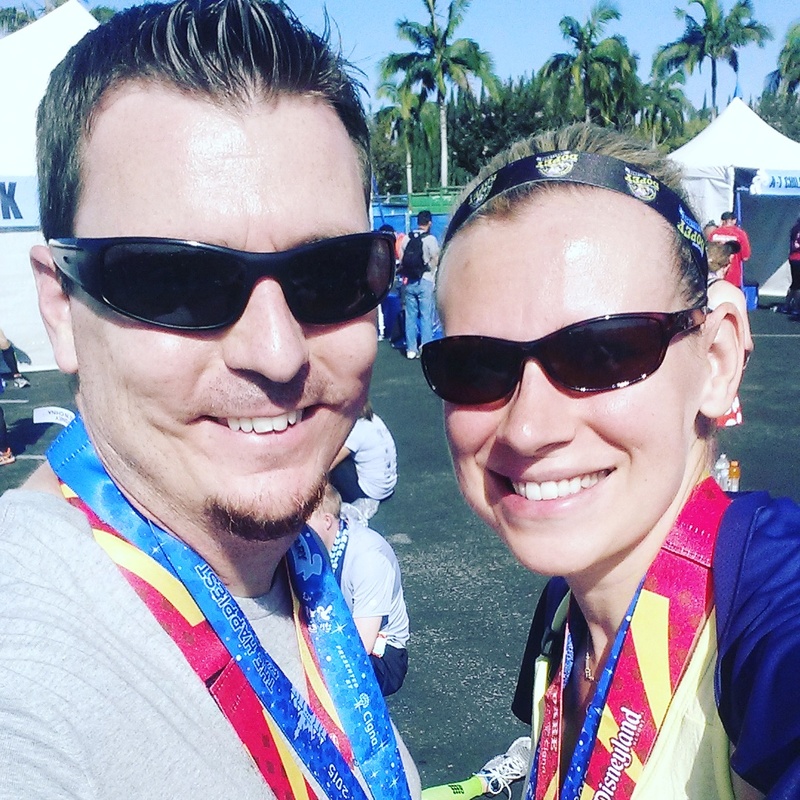 We found ourselves running really slow because we were surrounded by runners with a slower pace. It's kind of a funny phenomenon. You just end up going with the flow, and it was okay with us! We finished in about 3:30 I think--I haven't even bothered to look. Total stop time, according to my Garmin was 17+ minutes. That's a LOT of potty breaks! This was one of the most fun times I've had at the race though. No pressure, lots of great conversation with my hubs, and no soreness/limited tiredness at the end. Of course, I already have my plan set to come back with a vengeance in 2016! I'm going back to chasing PRs in 2016!!!! Guess it's a hard habit to break!!! 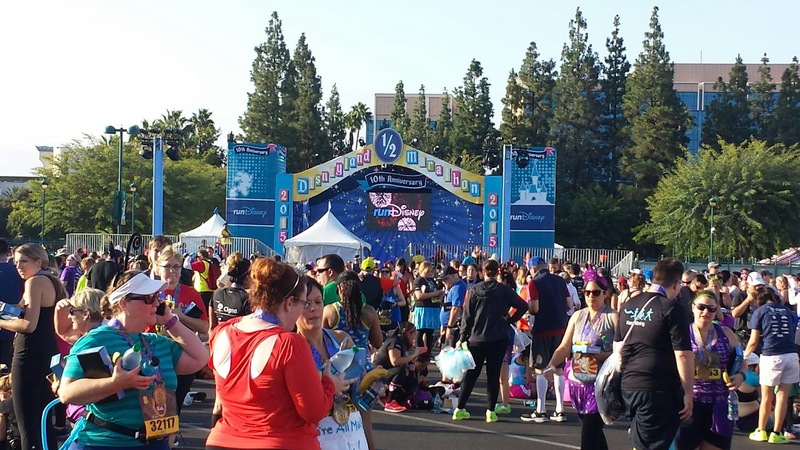 What did you think of the 2015 Disneyland Half? 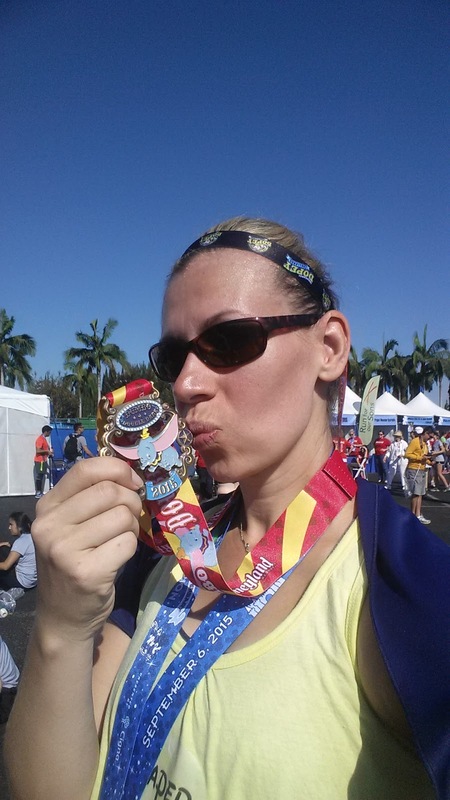 Did you notice a difference in the course, or was I crazy? I loved your shirts! Super cute! And good job mama for running a half! 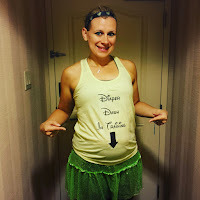 Your T-shirt is really cool, I like it and I would also love to run in a marathon during my Disneyland Paris Short Breaks. Amazing job done by you.